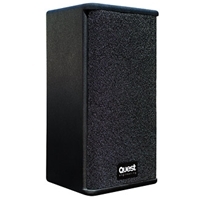 The HPI-8 is a compact full range passive loudspeaker suited to multiple audio tasks. A high quality European manufactured horn loaded compression driver matched to a 270 watt RMS power handling, high excursion woofer deliver exceptional output. The ultra compact nature of the enclosure makes it suitable for stand alone, ‘infill’ or primary sound source where architectural considerations require a small and discrete installation. The sonic character of the package is tuned to deliver outstanding vocal fidelity. As a vocal monitor, the HPI-8 requires next to no added equalization when employed with standard vocal microphones. The Music program reproduction of the HIP-8 is of sufficient quality for reference or cuemonitoring in hostile environments, where studio style monitors could be unsuitable. The HPI-8 is at home in corporate audio, theatre, disco, live production and broadcast, to name a few applications in which this compact package will excel.